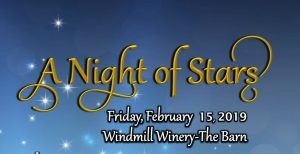 The Central Arizona College Foundation will host the annual Night of Stars event on Friday, February 15, 2019 at the Windmill Winery (1140 W. Butte Avenue, Florence, AZ.) The event begins at 6 p.m. and will feature a silent auction, delectable dinner and music by Laura Walsh. The night of celebration will recognize alumni and friends who have generously given of their time, talents and treasures to the CAC Foundation and College. Tickets to attend the celebration are $60 per person. Reservations must be made by January 31, 2019. Funds from this event will support scholarships and programs that provide a high quality and affordable education for CAC students. To purchase tickets or for additional information visit www.centralaz.edu/stars.